When Your Toddler Needs Surgery. Before, During, and After. Finding out your child needs surgery can be hard. Super hard. Especially when your child is a toddler and doesn’t understand what is going on or why she will be in pain. I am no expert in child surgery. I am just a mom that recently went through this and wanted to share my story. In part of trying to prepare myself I tried to look up blog posts online from other parents that went through something similar, and couldn’t find much. So incase someone else travels down this path, I wanted to share. Before surgery prepare yourself and your child. Have all your questions written down and make an appointment with your doctor just to ask questions if you need to. Talk with your child about it. The talking is as much for your as it is for them. Talk about having to go to the hospital, staying some place new for a few days. Keep it simple depending on your child’s age. Depending on your child’s age show them the hospital before hand if you think that will help. Make a list ( I love lists) of everything you will need, especially if you will be spending the night (or 2, or more). Pack the night before. Have clothes laid out the night before, especially if your child’s surgery is first thing in the morning. Buy your favourite snacks and/or candy. Pick up some new books or magazines. Depending on what surgery your child will have see if you can bring some of their favourite snacks for after surgery. Have their favourite foods at home waiting, or special foods like ice cream. Do a deep clean of the house, depending on recovery you will not have much time for anything else other than your child after surgery. Have some meals prepped and in the freezer for after. Decide ahead of time if and when you will have visitors. We personally decided against visitors because it would upset our daughter when they had to leave and the crying and freaking out would hurt her throat even more. There isn’t much to do while your child is in surgery besides sit there and go crazy. Depending on your hospitals layout chances are the operating room may be on a different floor than where you may be staying, either way you will not want to carry a lot of stuff around with you. So pack your purse or bag wisely. Speaking of your bag/purse, pack distractions for yourself in there. Pack some candy or snacks, magazines, books, new apps / games on your phone. Pack some of your favourite items, lip gloss, chapstick, jewelry. I have a piece of Sea Glass on a Necklace that I tend to play with and rub when stressed and worrying. While your child is in surgery make sure you go to the bathroom! Seriously. Once your child comes out they will only want you. My daughter didn’t let go of me for hours, she slept, she cried, and she held on tight. I couldn’t get up for hours, and I never thought to use the bathroom before she finished surgery. Breathe. Deep, slow, breaths. Focus. Chances your child will be a little out of sorts, your child will be in pain, your child will be confused, and your heart will just break. Prepare for cuddles. Lots of cuddles. A few months back I found out that my toddler needed surgery. I knew it was coming. I knew what to expect when I walked into the doctors office that morning. What I wasn’t expecting was how crushed I was going to feel. How completely gutted. How completely helpless, how completely out of control, how much of a failure I would feel like. Anxiety and depression can make you think and feel crazy things like something like this is actually in your control, when in fact it is not. My daughter’s tonsils and adenoids were so large that they were almost blocking her airway completely. She also needed tubes put in both ears. Nothing I could have done would ever change this. This was out of my control. The only thing I could control was allowing her this surgery to correct the problem. My big boy had to have tubes put in when he was 4 years old. So I knew what to expect with regards to that. But the tonsils and adenoids, I had no idea. It was so scary not knowing. The not knowing of what would happen during surgery scared me, the not knowing what to expect during recovery scared me even more. I was told my daughter could spend any where from 1 day to a whole week in hospital. She ended up staying 4 days. 4 very long, extremely stressful days. Something I hope to never have to repeat. Ever. When you find out that your child is having surgery it can be such a scary time no matter how big or minor it is. When the doctor asks, “Do you have any questions?”, chances are you will have a million, just not right at that moment. Make sure you write down all of your questions for your next appointment. Even have a dedicated notebook just for your questions so you have them all in one place. I honestly can not tell you how many times I called my doctors office to ask them questions. Just like in school when they say, “There are no stupid questions.” that comes into play here, don’t be afraid to ask anything. It helped ease my anxiety knowing that I could ask anything and I would always get an answer. Just make sure to write them all down. 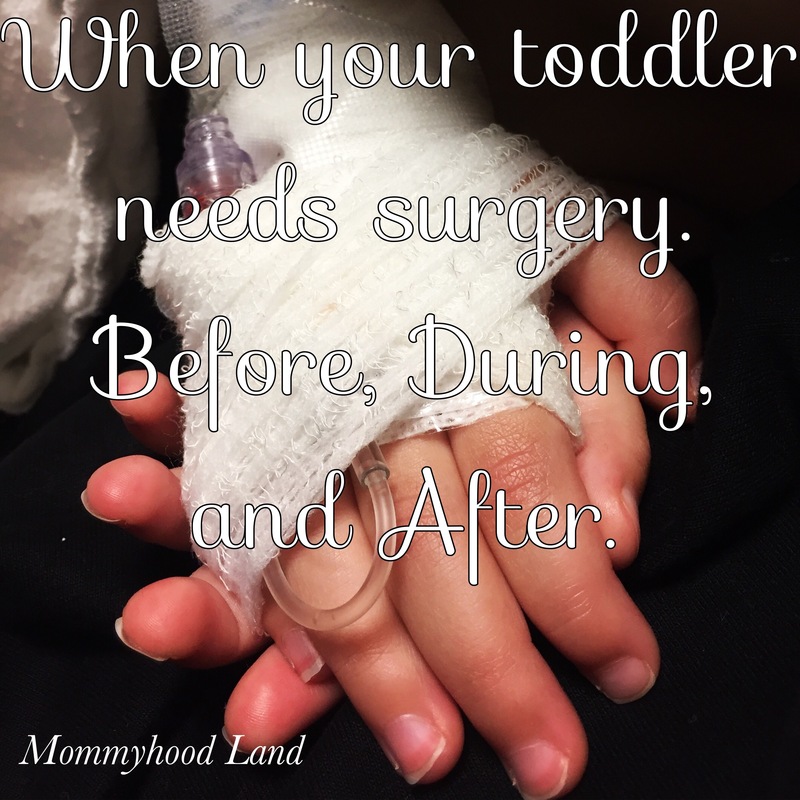 When your toddler needs surgery the internet can be your best friend and worst enemy. While I suggest knowing about any surgery your child will need, I do suggest having your husband, check websites with you, or before you. I made the mistake of looking up my daughters surgery and ended up on every bad news, horrible story, worst case ever, story, nothing really of real information all a sort of dooms day. If you have severe anxiety like me, have someone with you when you turn to the internet. At the end of the day, nothing can really prepare you for your child, let alone toddler who doesn’t fully understand whats going on, to have surgery. Trust in yourself, your partner, your doctor, and if you believe in God or higher power. My energy level, motivation level, my anything level really is at zero. Last Friday I had surgery. I have been forced to take it easy, which is making me go stir crazy! Then on top of it we have been having crazy gloomy weather which has just been sucking whatever life I had left. Now here we are Monday morning and all I want to do is sleep, but I have kids so we all know that won’t happen. Why is it when I’m in the middle of the hustle and bustle of life I can’t wait for a break, time to slow down, time to relax, time to read or catch up on a show. And then when I actually get the chance to slow down (even though it was forced on me) all I want to do is to do all the stuff?! Seriously the mom guilt, the to-do lists, the boredom has just grown and grown! Its unreal, and so stupid, but its there. I had surgery. I have no choice but to take it easy, something I have been wanted to do, and then it happens, and Hello Mom Guilt. This week is about recovering and not losing my mind while I do it. While also taking care of my 3 kids. I love it when the hospital told me to take it easy and not do anything for two weeks, and I said I had 3 kids to take care of including a toddler, their response “Oh, well then… just try to take it easy, if possible.” That is what I am going to try to do: recover and rest, while not going crazy, taking care of my 3 kids while not over doing it. Yup, sounds easy enough.